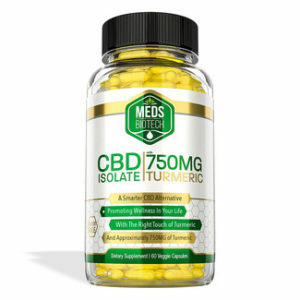 Meds Biotech CBD Isolate and Tumeric Hemp oil Capsules. Pharmacist formulated CBD cannabidiol capsules that contain a regular dose of Turmeric. 20mg of CBD and 25mg of Turmeric per serving. 60 capsules. 600mg of Industrial Hemp Cannabidiol (CBD), 750mg of Turmeric per container.